All Web addresses mentioned were functional as of 8-5-16. From the Cumberland Gap to the Atlantic Ocean, this is Virginia Water Radio for the week of August 8, 2016. This week, music by a Harrisonburg, Va.-based band helps deliver a message about flash flooding, one of the most dangerous kinds of weather-related disasters. Have a listen for about 40 seconds. You’ve been listening to part of “Rain in the Valley,” by The Steel Wheels, from their 2012 album, “Lay Down, Lay Low.” According to the song’s composer, the lyrics were inspired by a friend’s experience of a flash flood in Virginia’s Shenandoah Valley. 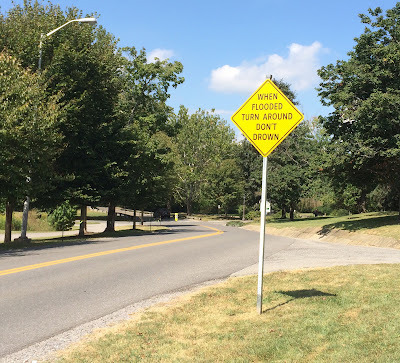 Fortunately, that friend lived to tell the tale, because flash floods all too frequently have tragic consequences, including very recently in West Virginia in June 2016 and in Ellicott City, Maryland, on July 30, 2016. According to the National Oceanic and Atmospheric Administration, floods in general are the most common weather-related disaster, and flash floods are the most dangerous kind of floods because they combine the destructive power, incredible speed, and unpredictability. Flash floods typically occur when intense rainfall causes rapid water rises in waterways or even in normally dry channels. Some flash-flood risk areas include low spots in urban areas; steep terrain, particularly if recently burned or otherwise unvegetated; recreation areas along streams or rivers; low-water crossings; areas subject to ice jams or rapid snowmelt; and areas behind river levees or below dams, which, unfortunately, sometimes fail. Wherever you are, if you receive a National Weather Service flash flood watch, be alert to possible flash flooding within the designated watch area; and if you receive a flash flood warning, take necessary precautions at once, because flash flooding has been reported or is imminent. Among the most important precautions are the following: if you receive a warning, head for higher ground; stay away from floodwaters; avoid walking or driving through flowing water; if water is rising around your vehicle, get out of the car and move to higher ground; and avoid camping or parking along streams or rivers during the warning period. More details on flash floods or other floods are available from the Virginia Department of Emergency Management, online at readyvirginia.gov. This week’s music, “Rain in the Valley,” written by Trent Wagler, is from The Steel Wheels’ 2012 album, “Lay Down, Lay Low,” used with permission. More information about The Steel Wheels is available online at http://www.thesteelwheels.com/. Information on the song’s background was taken from Songfacts, “Rain in the Valley by The Steel Wheels,” undated, online at http://www.songfacts.com/detail.php?id=29969. 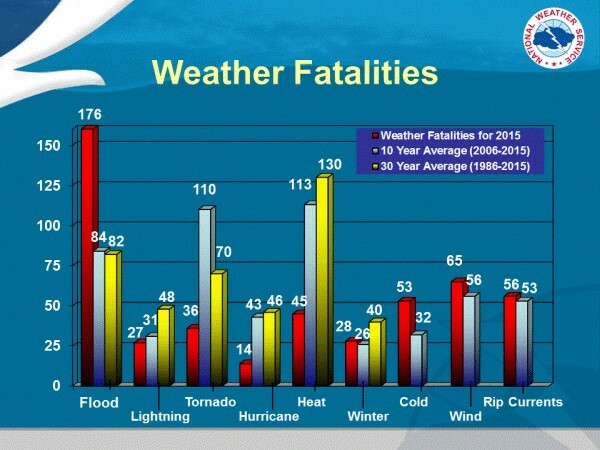 Above: Floods caused the highest number of weather-related fatalities in the United States in 2015, and the second-highest number over the past 30 years. Image from National Weather Service/Office of Climate, Water, and Weather Services, “Natural Hazard Statistics,” online at http://www.nws.noaa.gov/om/hazstats.shtml. An example of how quickly small streams can rise and fall. 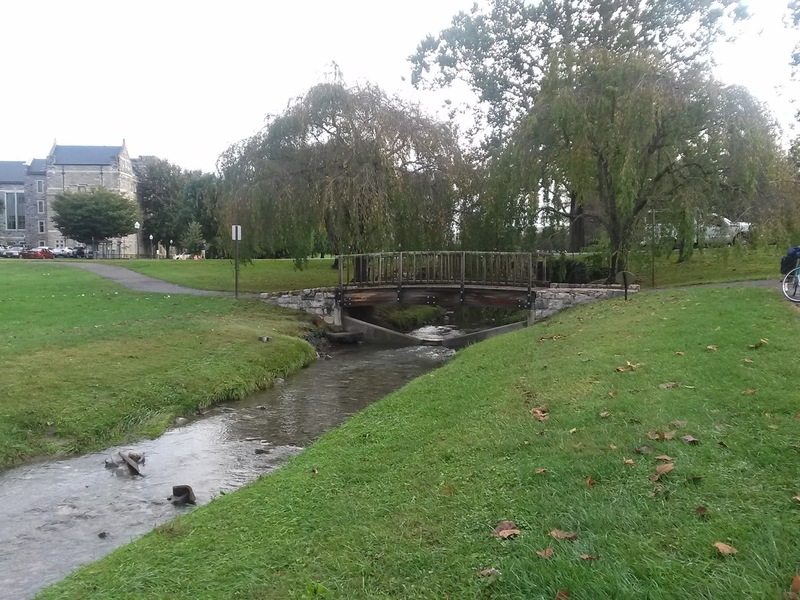 Upper: Stroubles Creek after heavy rain on the Virginia Tech campus, September 29, 2015, 12:30 p.m. Lower: The same stream on September 30, 2015, 9:30 a.m.
A sample of road signs warning motorists not to drive through flooded roadways. Upper and middle: along Passage Creek in Fort Valley in Shenandoah County, Va., Aug. 22, 2016; lower: along Duck Pond Drive before the Stroubles Creek crossing on the Virginia Tech campus in Blacksburg, Sep. 13, 2016. Flooding occurs in every U.S. state and territory, and is a threat experienced anywhere in the world that receives rain. In the U.S. floods kill more people each year than tornadoes, hurricanes, or lightning. Mountains and steep hills produce rapid runoff, which causes streams to rise quickly. Rocks and clay soils do not allow much water to infiltrate the ground. Saturated soil also can lead rapidly to flash flooding. Vacationing or recreating along streams or rivers can be a risk if there are thunderstorms in the area. 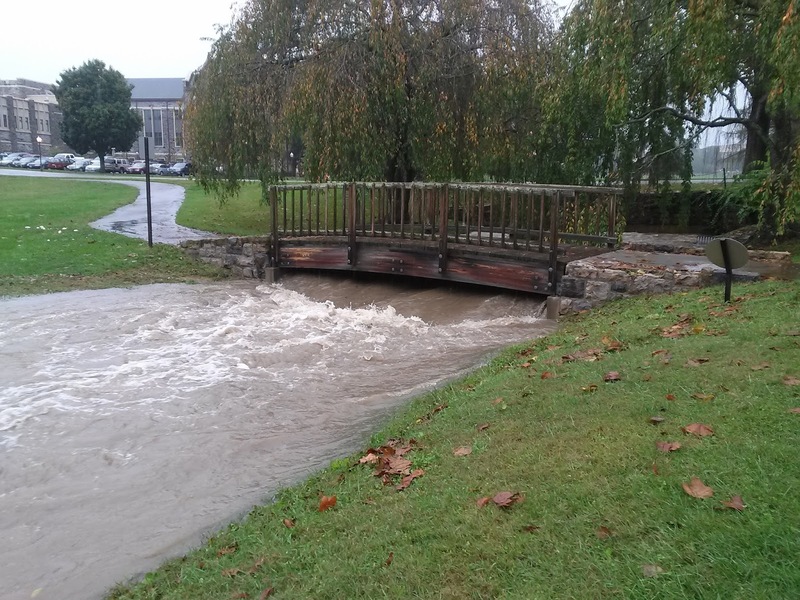 A creek only 6 inches deep in mountainous areas can swell to a 10-foot deep raging river in less than an hour if a thunderstorm lingers over an area for an extended period of time. Ice jams and snowmelt can help cause flash floods. Tom DiLiberto, Thousand-year' downpour led to deadly West Virginia floods, National Oceanic and Atmospheric Administration (NOAA) Climate.gov Web site, 7/8/16. Jeff Halverson, This is how an ‘off-the-charts’ flood ravaged Ellicott City, Washington Post, 8/1/16. The item includes a 1 min./25 sec. video, “How a flash flood occurs and what you should do if caught in one,” by Clarita Jimenez. American Red Cross, “Flood Safety,” online at http://www.redcross.org/prepare/disaster/flood; or contact your local chapter (listed in your local phone directory). Federal Emergency Management Agency, “Floods,” online at http://www.ready.gov/floods. National Oceanic and Atmospheric Administration/National Severe Storms Laboratory, “Severe Weather 101: Floods,” online at http://www.nssl.noaa.gov/education/svrwx101/floods/. National Weather Service, “Flood Safety,” online at http://www.floodsafety.noaa.gov/. National Weather Service/Office of Climate, Water, and Weather Services, “Natural Hazard Statistics,” online at http://www.nws.noaa.gov/om/hazstats.shtml. National Weather Service/Sterling, Va., Forecast Office, “Ellicott City Historic Rain and Flash Flood-July 30, 2016,” online at http://www.weather.gov/lwx/EllicottCityFlood2016. Jason Samenow, “West Virginia flood was ‘one in a thousand year event,’ Weather Service says; more heavy rain forecast,” Washington Post, 6/27/16. Virginia Department of Emergency Management, “Floods,” online at http://www.vaemergency.gov/readyvirginia/stayinformed/floods. West Virginia Department of Homeland Security and Emergency Management, Flood Update from WVDHSEM Tuesday Morning, June 28, 2016. Federal Emergency Management Agency, “Natural Disasters,” online at https://www.ready.gov/natural-disasters. FloodList, online at http://floodlist.com/. This Web site reports news of floods around the world; see http://floodlist.com/about-us for a description of the site’s purpose, funding, and staff. National Flood Insurance Program, online at https://www.floodsmart.gov/floodsmart/. This site includes a tool for determining a given property’s financial flood risk. National Weather Service, “Weather Safety,” online at http://www.nws.noaa.gov/safety.php. National Weather Service/Storm Prediction Center, online at http://www.spc.noaa.gov/. Virginia Department of Emergency Management (VDEM), “Ready Virginia” Web site, online at http://www.vaemergency.gov/ReadyVirginia; or contact VDEM at (804) 897-6500 or pio@vdem.virginia.gov. Virginia Water Central News Grouper posts on news, events, and information resources relevant to severe weather, online at https://vawatercentralnewsgrouper.wordpress.com/?s=severe+weather. Previous episodes on flash flooding are Episode 272, 6/29/15 (on flash floods centered in Madison County, Va., in June 1995) and Episode 192 (12/16/13) (on the Rockfish River in Nelson County, Va., in 1969). A previous episode on historic river flood levels is Episode 86, 10/31/11. A previous episode on National Weather Service watches and warnings is Episode 102, 4-91-12. For other episodes on weather and disaster preparedness, see the Weather/Natural Disasters topic category in the Index.